Instead of giving yourself and others excuses, start asking yourself if your goals to get healthy and fit are really important to you. If it is, you will find a way. Not an excuse. I think I’ve heard every excuse in the book. Heck, I’ve GIVEN every excuse in the book. Reasons why I just couldn’t find the time to workout and get closer to my fitness goals. There were plenty, and I just kept them coming. Maybe you do it to. You tell yourself your family has its needs and by catering to them instead of working out, you are making an okay decision. Or you didn’t sleep well the night before, so it’s okay to sleep in and miss your workout this time. Sure, family and sleep are definitely important parts of life, but you have to really ask yourself – is getting MYSELF healthy important?? Once you start looking at things that way and really asking yourself about what’s important to you, making the decisions to actually start reaching those goals become quite a bit easier. You can use this in all aspects of your life. I use it all the time for my business. Is it important to me? Extremely! That is why I make the sacrifices in my life that I make in order to reach the goals I have set for myself. I get up at a ridiculously early time to get right to work. I work two jobs for the time being to make this all happen. I have my priorities, and that is something I have ingrained in myself. But let’s talk about your health goals. Why is getting healthy important to you? I can tell you why getting healthy is important to me. * So I can live a long life with the people that I love. * So I can be a good mama for my son. * So I can FEEL healthy on a daily basis and be able to enjoy life. * So I can inspire and motivate others. These are some pretty important reasons for me, and that is why I don’t make excuses. My excuses are never bigger than these important reasons for why I need to be healthy. So you need to decide if this is something that’s really important to you and why it is. Once you get those reasons written down, set in stone, your excuses seem minimal. That lack of sleep the night before doesn’t matter when you know that you are trying to stay healthy for your family and your well-being. I hope this inspires you to have an amazing and productive week working toward your health. The most important gift you can give yourself and your loved ones. 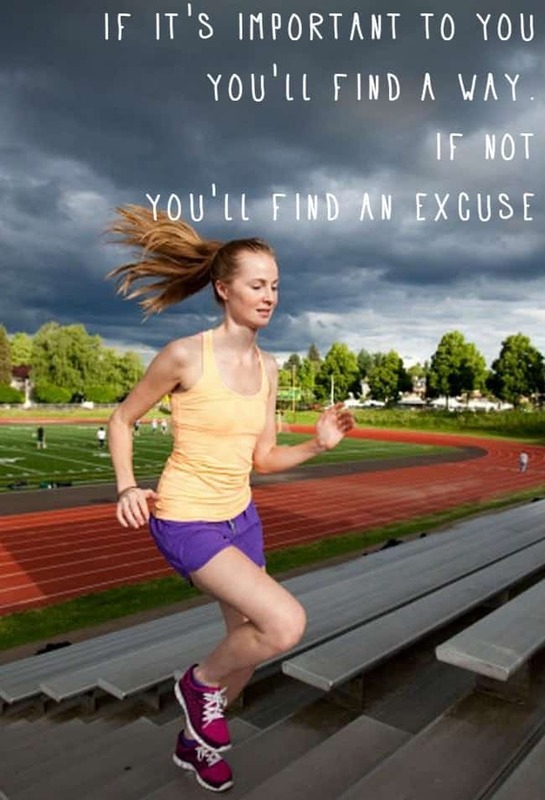 I agree that you shouldn’t make excuses. But, I think that you need to listen to your body. Forcing yourself through a workout on a few hours sleep is a bad idea! Sleep is a crucial element to health. Maybe sometimes you need to go ahead and sleep in and do an evening yoga class instead of your morning HIIT workout. It will serve you better in the long run to listen to your body and not burn out your adrenals by not giving your body rest.